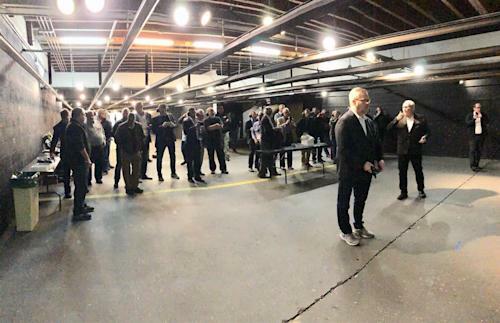 Wrap Technologies Demonstrates BolaWrap 100 to the International Community | Wrap Technologies, Inc.
LAS VEGAS, NV / ACCESSWIRE / January 24, 2019 / Wrap Technologies, Inc. (the “Company“) (WRTC), an innovator of modern policing solutions, reported that it hosted an invitation only demonstration of the Company’s first product, the BolaWrap 100, to more than 25 representatives from distributors from 10 different countries on Wednesday. The areas represented included North and South America, Europe and Asia. This press release contains “forward-looking statements” within the meaning of the “safe harbor” provisions of the Private Securities Litigation Reform Act of 1995, including but not limited to statements regarding the Company’s overall business, total addressable market and expectations regarding future sales and expenses. Words such as “expect,” “anticipate,” “should,” “believe,” “target,” “project,” “goals,” “estimate,” “potential,” “predict,” ‘may,” “will,” “could,” “intend,” variations of these terms or the negative of these terms and similar expressions are intended to identify these forward-looking statements. Forward-looking statements are subject to a number of risks and uncertainties, many of which involve factors or circumstances that are beyond the Company’s control. The Company’s actual results could differ materially from those stated or implied in forward-looking statements due to a number of factors, including but not limited to: the Company’s ability to successful implement training programs for the use of its products; the Company’s ability to manufacture and produce product for its customers; the Company’s ability to develop sales for its new product solution; the acceptance of existing and future products; the availability of funding to continue to finance operations; the complexity, expense and time associated with sales to law enforcement and government entities; the lengthy evaluation and sales cycle for the Company’s product solution; product defects; litigation risks from alleged product-related injuries; risks of government regulations; the ability to obtain patents and defend IP against competitors; the impact of competitive products and solutions; and the Company’s ability to maintain and enhance its brand, as well as other risk factors included in the Company’s most recent quarterly report on Form 10-Q and other SEC filings. These forward-looking statements are made as of the date of this press release and were based on current expectations, estimates, forecasts and projections as well as the beliefs and assumptions of management. Except as required by law, the Company undertakes no duty or obligation to update any forward-looking statements contained in this release as a result of new information, future events or changes in its expectations.